The Thread-N-Mask (TNM) plugs are self-tapping. 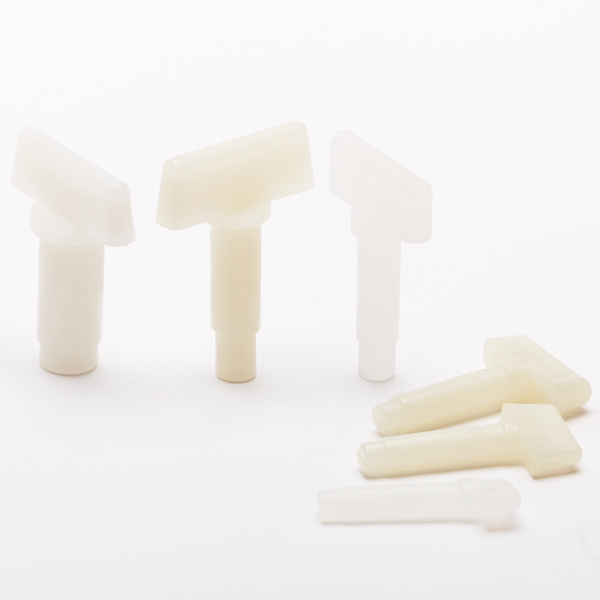 Made from a pliable LDPE plastic, these plugs offer excellent chemical resistance. They are inexpensive enough to be used only one-time. Insert the lead-in smaller diameter squarely into the threaded hole. Begin twisting the TNM plug. The TNM will begin to take on the shape of the threads, forming a leak-proof seal. It is recommended that at least 1/4 of the plug be threaded into the hole. 0.082 MJ D X 0.062" MN D X 0." 0.100 MJ D X 0.080" MN D X 0." 0.106 MJ D X 0.085" MN D X 0." 0.120 MJ D X 0.095" MN D X 0." 0.131 MJ D X 0.105" MN D X 0"
0.156 MJ D X 0.136" MN D X 0." 0.171 MJ D X 0.413" MN D X 0." 0.186 MJ D X 0.150" MN D X 0." 0.212 MJ D X 0.180" MN D X 0." 0.270 MJ D X 0.210" MN D X 1." 0.335 MJ D X 0.295" MN D X 0." 0.400 MJ D X 0.348" MN D X 1." 0.470 MJ D X 0.400" MN D X 1."